It had always been my dream to own a vacation home in a foreign country. I hoped to visit it often, and even trade it for 2 weeks vacation in another location that I wanted to visit. We already own a ski condo across the country from us but don't visit often. It was purchased as more of an investment. I love to travel outside of the US and had been collecting information for years about purchasing a vacation home in Italy. Watching HGTV's House Hunters International only fueled that desire more. People were buying run down villas for $ 40,000 and fixing them up. I thought, I could do that. Then we started visiting South and Central America and saw so much more potential in real estate there. The real estate prices were cheaper and for us, it was easier to get to, closer to the US in case of a medical emergency, and in some cases there was no time difference, a huge plus. In Ecuador, Panama and Belize, we would look at property in tourist destinations, but without a real plan, we got nowhere fast. Then enter Roatan. Being a certified scuba diver, I had been familiar with Roatan for years, and we were planning a trip during my daughter's school break in April. Most of my friends had never heard of it but from everything I read, it was becoming more popular, especially with the new cruise ship terminal, Mahogony Bay. Now was the time to buy before it got discovered. So I started my research. I found that there was a Multiple Listing Service, MLS, on the island and US branded real estate companies along with many local companies. I started checking out the MLS and saw there were many properties in our price range, both free standing homes and condos. Our requirements were simple, 2 bed, 2 bath, beach access and a pool. Never having been there, I wasn't sure of the location we should chose but I know us, we are not party people and prefer peace and quiet yet need to be close to shops and restaurants. I found many listings all over the island and figured once we were there, we could get a feel for the areas and make a decision then. Now to find an agent. One local agency seemed to be all over the Internet and had a lot of the listings on the MLS so I sent them an email outlining what we were looking for and our budget. Basically what I got in a return email was a kiss off. I was told if that was my budget, I should look elsewhere. What??? I knew from my extensive research that they were many properties that fit my criteria and budget on Roatan. Oh well, time to move on. Next I decided to forgo a local company and try the US branded companies. I reached out to both and got calls back almost immediately. Both seemed good and answered all my questions though one kept pushing a complex that I was not interested in as it was not on or near a beach. As we would email back and forth, that same agent kept pushing that same complex so I moved on to the other agent, Marisol, from Century 21, who really listened to me and what we were looking for. She sent me listings and answered many questions from me on property I saw on MLS, steering me away from properties that had issues. Before we left for Roatan, we gave her our list of top properties we were interested in seeing and she set everything up for us. Again, because we weren't familiar with all the locations, we had properties all over the island we wanted to see. We stayed at Infinity Bay on West Bay Beach and were glad we did because we realized it was not for us. West Bay Beach is beautiful, but crowded, noisy and the beach is narrow. When the cruise ships came in, it got even worse. Time to cross the West Bay condos off our list. Marisol picked us up the 2nd day of our trip at our condo and showed us many properties that fit our criteria. We saw houses and condos and realized condos weren't for us nor were freestanding homes not in gated communities. Then we went to the Resort at Palmetto Bay, a gated community of Bali inspired homes. 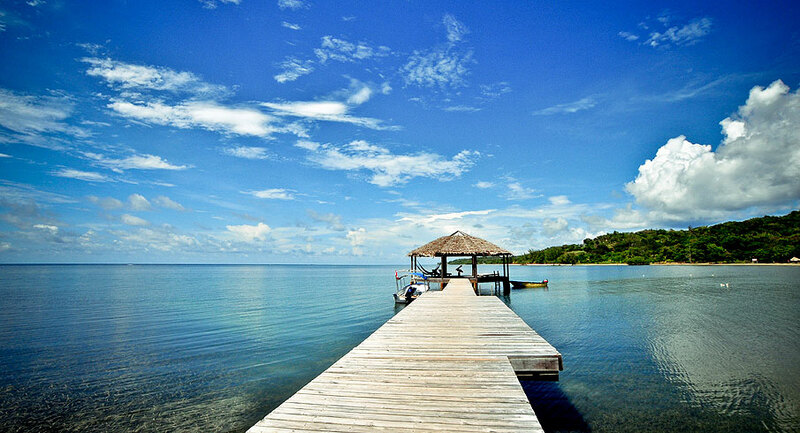 We loved the location, the north shore about midway on the island, peaceful and quiet, away from the hustle and bustle of West End and West Bay, but close enough to get to all that Roatan has to offer. In addition, we figured development could only move eastward, thus hopefully making our home appreciate in value. Before we left home, the MLS had 4 homes at Palmetto for sale but when we got there a few days later, 2 were already under contract. We viewed the remaining 2 homes and fell in love with one, of course the one that was more expensive and over our budget. On the ride back to West Bay we decided to put an offer in on the expensive house at Palmetto. We asked Marisol to put the offer in for a price much below asking but what we could afford. We figured we did really like the other house also, and it was much cheaper, so if this offer wasn't accepted, we always had the other house to fall back on. We expected to return home and wait for a response to the offer but within a day, we received a counter offer and after some minor negotiation, the house was ours. Marisol then offered to take us back to Palmetto so we could more carefully inspect the home as home inspections are not common on Roatan. We took her up on the offer and went back on our last day of vacation with our cameras. We met one of the managing companies at Palmetto, there are about 4, and decided to go with them as they seemed on the ball and trustworthy. We went back to the states and handled all the closing paperwork, insurance, etc, through email and with the help of Marisol, who also recommended a Honduran attorney to handle the legal matters. Everything went off without a hitch and we are now the proud owners of the Tropical Garden Villa, a 3 bedroom, 2 bath home at the Resort at Palmetto Bay. 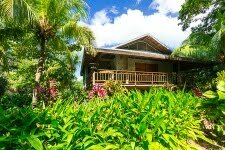 Stay at the Tropical Garden Villa while you search for that perfect home.